That’s “keen-wah tab-ooh-lay.” Don’t let the name scare you away from this incredibly simple and refreshing salad! I’ve been obsessed with tabbouleh since I first tried it as a child. It’s full of texture and tons of super fresh, vibrant flavors. 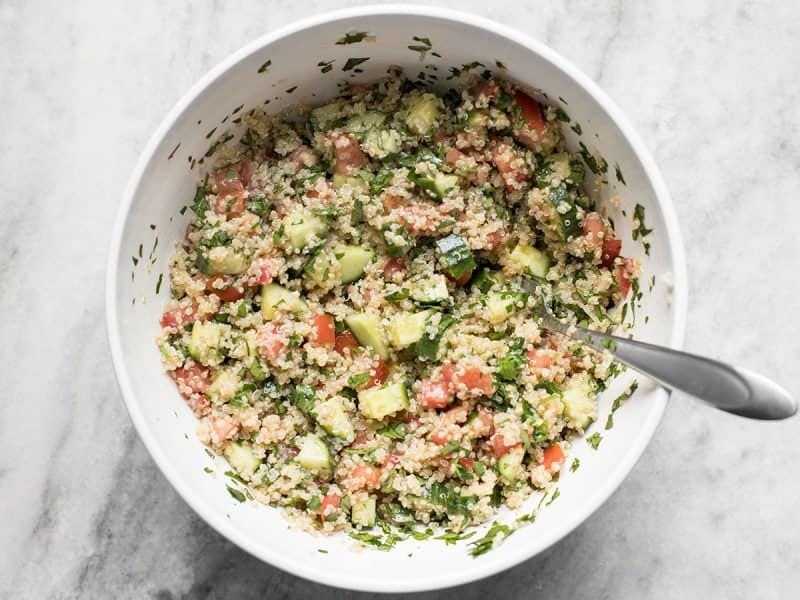 Traditional tabbouleh uses bulgur (cracked wheat) as the bulking agent, but that’s not always easy to find in American grocery stores. Quinoa, on the other hand, has been trending hard for the past 5+ years and can be found just about everywhere these days, and even for a reasonable price. So, I swapped out the bulgur and made Quinoa Tabbouleh instead! Want more quinoa recipes? Check out our Quinoa Recipe Archives! 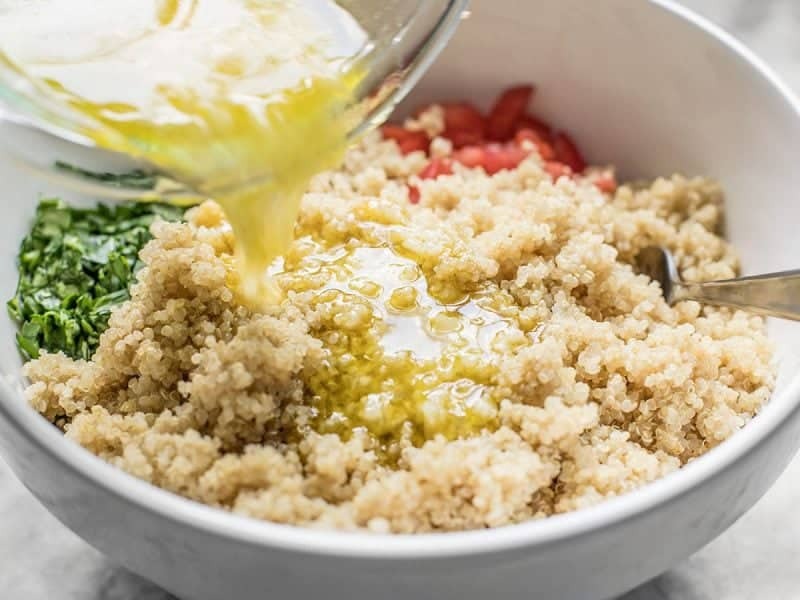 If you can’t find quinoa or bulgur, couscous is a great third option. All three items cook quickly and are usually available in bulk bins so you can buy just the amount you need. 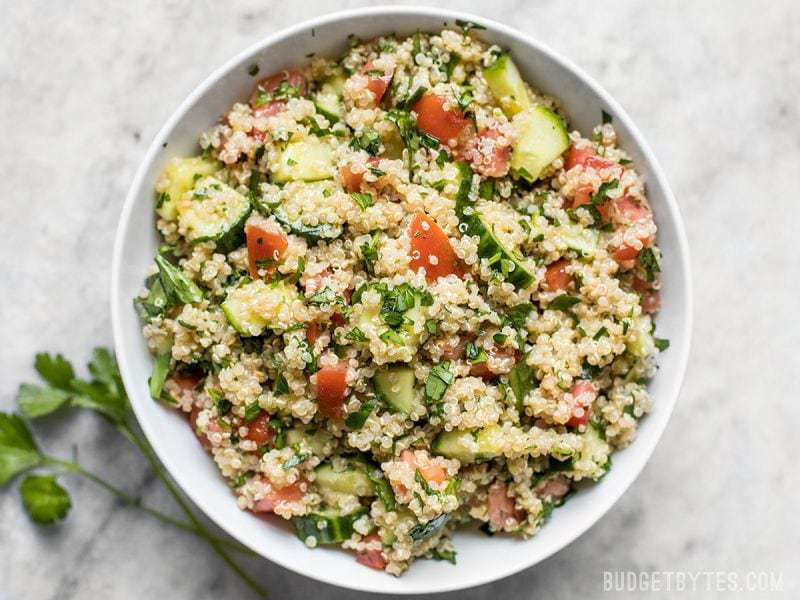 You can use either flat leaf or curly parsley for this salad, but the curly leaf will give the Quinoa Tabbouleh more loft and volume. The final volume of salad that this recipe makes will vary depending on the size of your tomato, cucumber, and parsley bunch, but it’s extremely flexible so don’t stress about the size of your vegetables. My salad yielded about 8 cups, but you could even add a second bunch of parsley if you want to stretch it out more. It will “shrink” as it refrigerates and the vegetables begin to wilt. 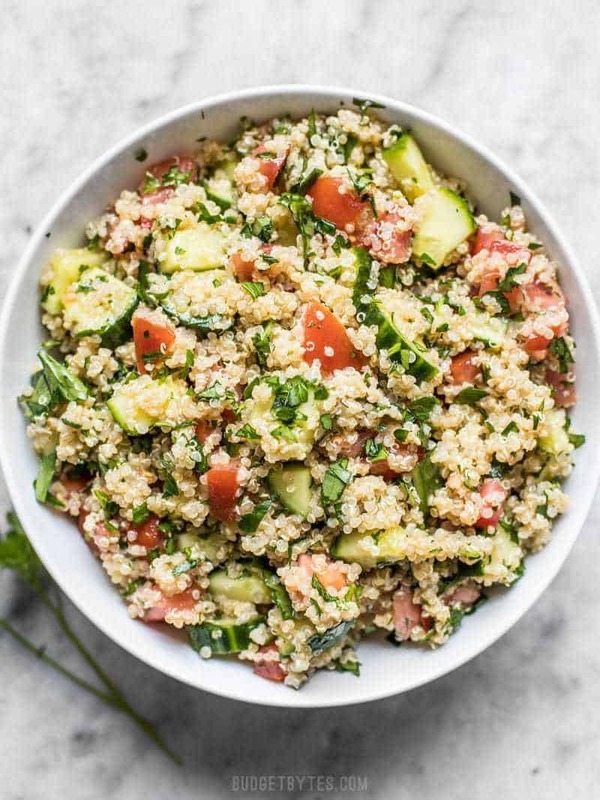 Quinoa Tabbouleh is Great for Meal Prep! This is an excellent salad to prepare ahead for the week. The vegetables are crunchiest on day one, but the flavors improve as they mix and meld in the refrigerator. Day two is my favorite, but every time I make this salad I enjoy it for a good four days or so. It’s great to keep in the fridge to either dish out as a snack, a side dish, or to add some chicken and feta to make a whole meal! 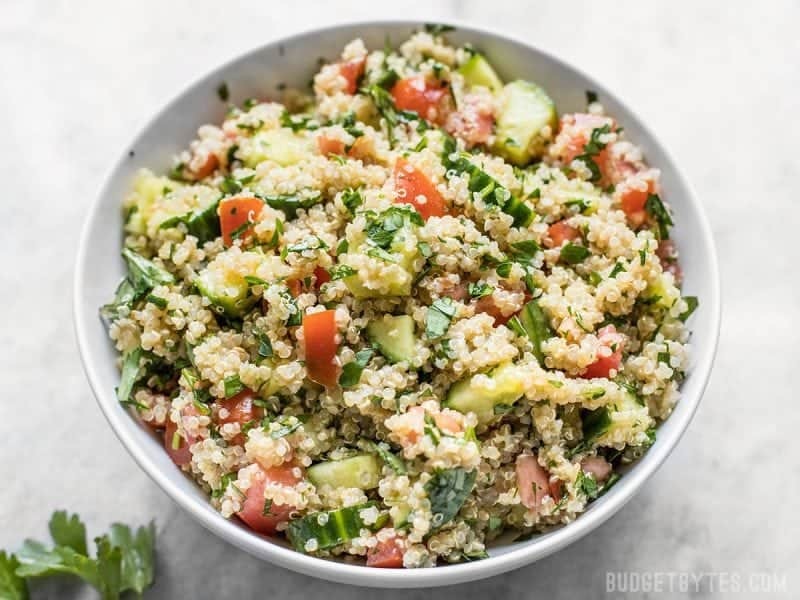 Fresh and vibrantly flavored, this Quinoa Tabbouleh has all the familiar flavors of traditional tabbouleh, but with easy to cook and nutrient rich quinoa instead of bulgur. Rinse the quinoa under cool running water. Place the rinsed quinoa in a pot with 1.75 cups of water. Put a lid on top, bring it to a boil over high heat, then reduce the heat to low and let simmer for 15 minutes. After 15 minutes, turn off the heat. Allow the quinoa to cool before making the salad or else the heat will wilt the parsley and vegetables. To cool it faster, spread it out on a baking sheet and place in the refrigerator for 30 minutes. While the quinoa is cooling, prepare the rest of the salad. 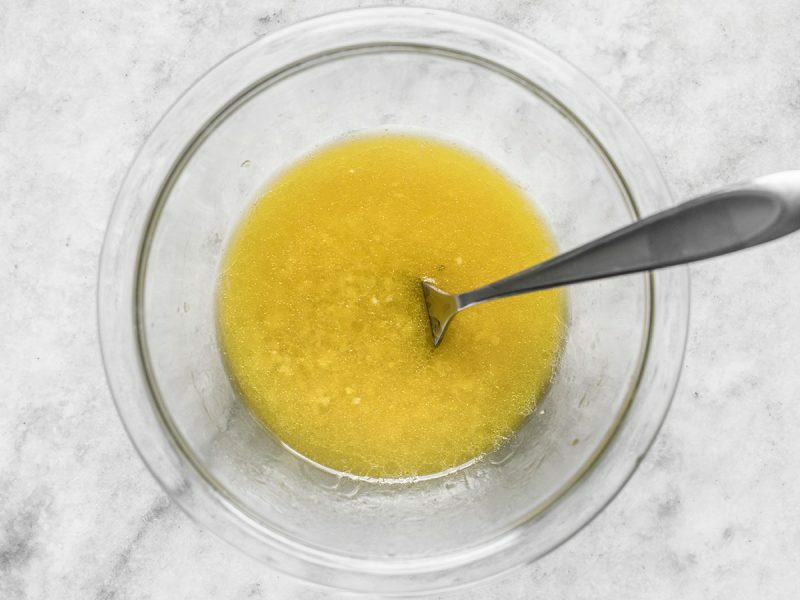 To make the dressing, squeeze the juice from the lemon into a bowl (about 1/4 cup). Mince the garlic and add to the lemon juice along with the olive oil and salt. Whisk to combine, then set the dressing aside. Dice the tomato and cucumber. Rinse the parsley well to remove sand and grit, then chop well. Add the cucumber, tomato, and parsley to a large bowl. Once the quinoa is cooled, add it to the bowl with the vegetables. Pour the dressing over top, then stir until everything is well coated. Serve immediately or refrigerate until you're ready to eat. Give the salad a brief stir just before serving. 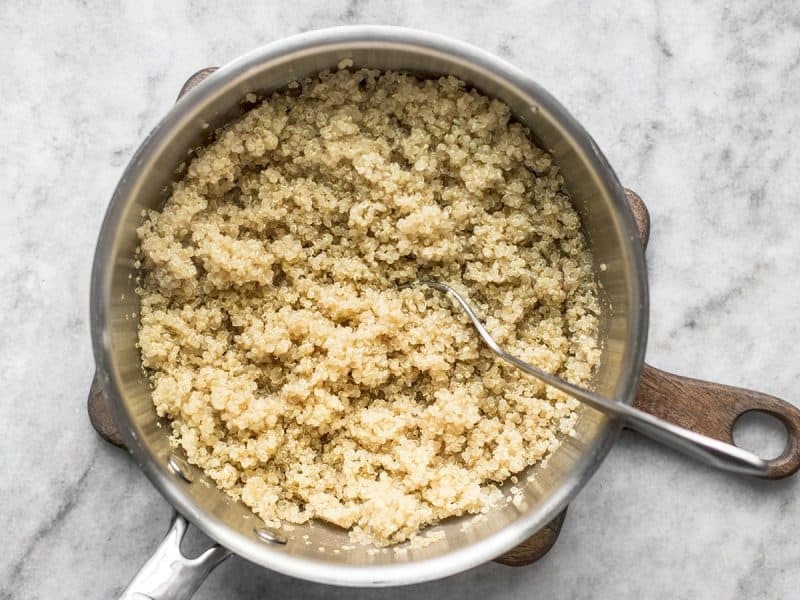 The first thing you’ll want to do is rinse the quinoa well. Quinoa is naturally coated with a substance called saponin that has a soapy, almost bitter flavor. Rinsing the quinoa will remove it and make the quinoa taste a LOT better. Place 1 cup rinsed quinoa in a pot with 1.75 cups of water. Place a lid on the pot, bring the pot up to a boil over high heat. As soon as it reaches a boil, turn the heat down to low, and let it simmer for 15 minutes. After 15 minutes, the quinoa will have soaked up all of the water. Allow the quinoa to cool before making the salad because you don’t want the heat to wilt the parsley or vegetables. 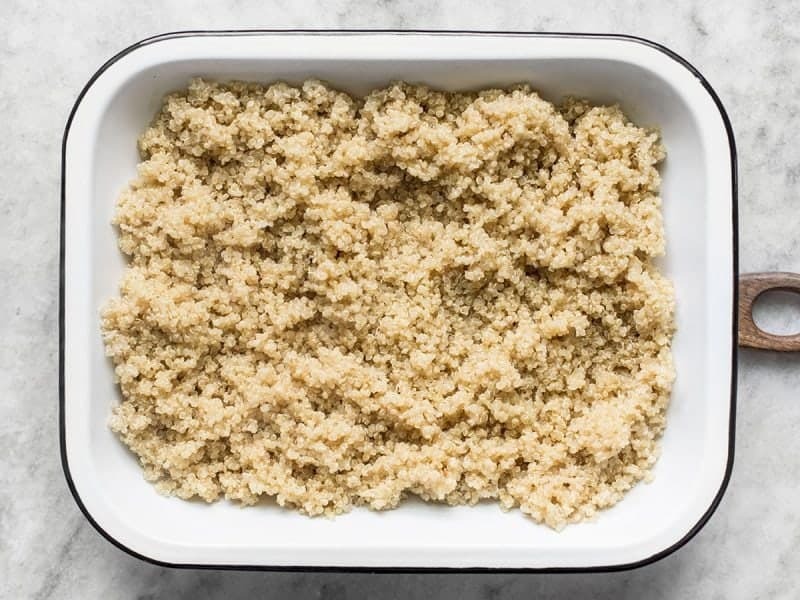 To make it cool faster, spread the quinoa out on a baking sheet and place in the refrigerator. It should cool significantly in 30 minutes. You can prepare the rest of the salad as the quinoa cools. Fresh lemon is really important for this recipe, so make sure you don’t cut corners here. Squeeze the juice from one lemon. You’ll need at least 1/4 cup lemon juice, but if you have a little more (up to 1/3) that’s okay. 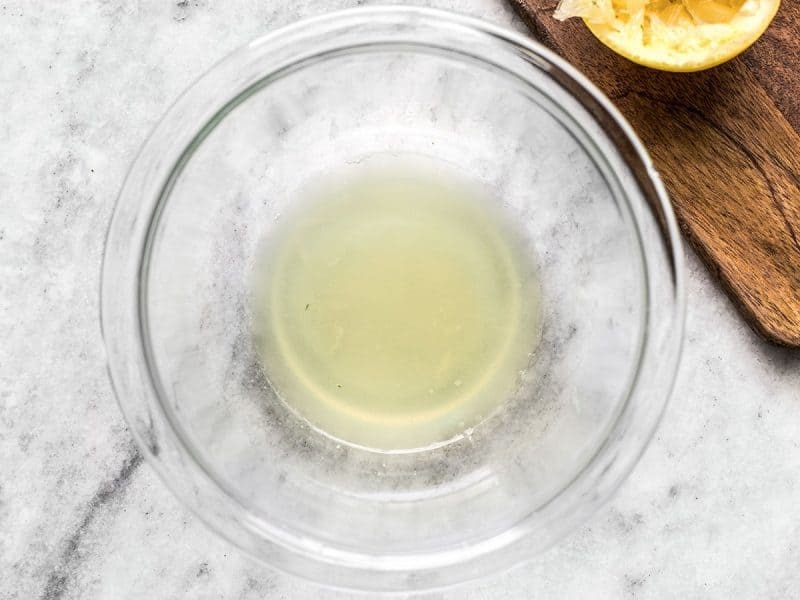 To the fresh lemon juice add 1/4 cup olive oil, four cloves of minced garlic, and 1 tsp salt. That’s it! Just whisk them together, then set them aside. Next, dice one large tomato and one large cucumber. You’ll want them to be fairly small pieces, so dice them a little small. Rinse your parsley well, then chop it fairly finely as well. 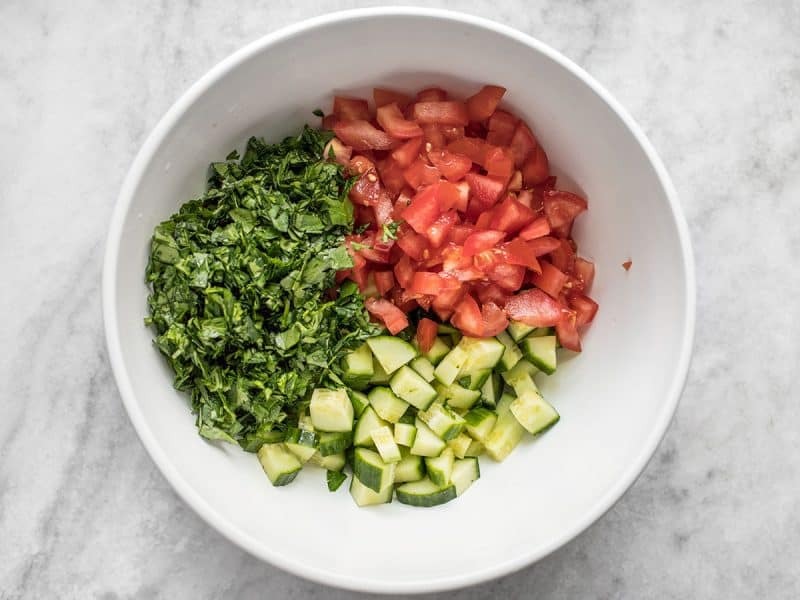 Place the cucumber, tomato, and parsley in a large bowl. Finally, add the cooled quinoa to the bowl. Pour the prepared dressing over top. Then just stir until everything is coated in dressing! That’s really all it takes! 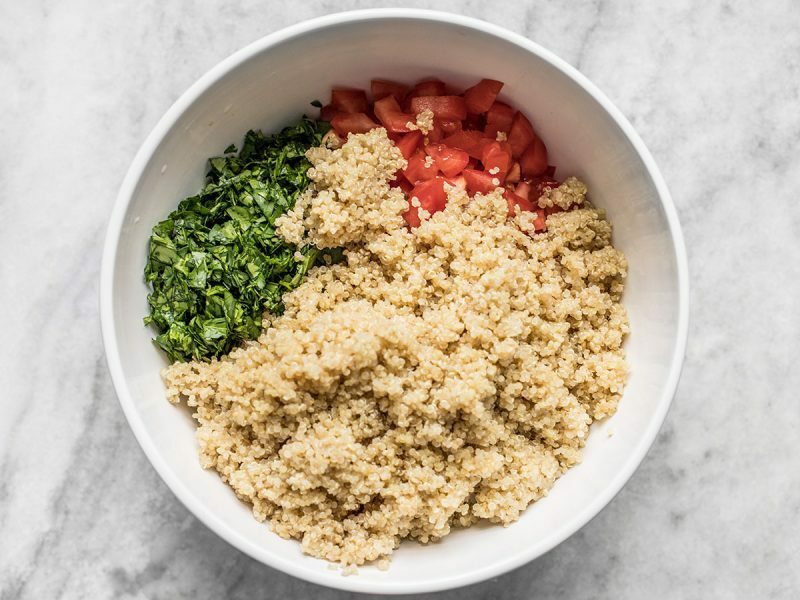 You can serve your Quinoa Tabbouleh immediately, or refrigerate for later. I like it after a little refrigeration, when the flavors have a little time to meld and the salad is ice cold! YUM. This is, hands down, one of my favorite recipes on this site. I have made it many times and it turns out perfect every time. Tastes even better the next day! Thanks, Beth!